Hublot starts the Geneva watch show 2018 in fine style, adding several new styles to its flagship Big Bang and Classic Fusion collections. 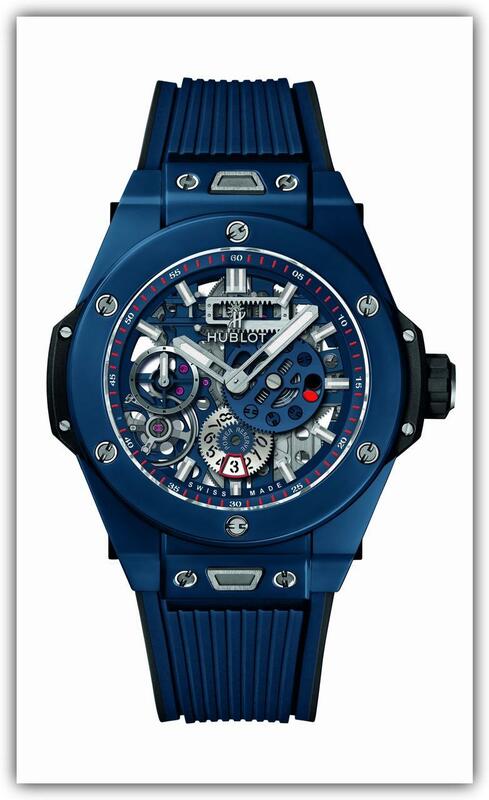 Taking on a mesmerizing indigo hue, Hublot crafts its iconic Big Bang case in blue ceramic, mounted on a matching rubber strap and framing a similarly-toned visible movement. Revealed through the dial and the sapphire crystal caseback, the manual-winding skeletonized caliber comprises 223 components and provides a 10-day power reserve. This movement took two years to develop, and its power reserve indicator is a testament to beauty and precision: an opening at 3 o'clock unveils a red dot when the movement is nearing the final days of its power reserve, while a gearwheel at 6 o'clock indicates the exact number of days remaining. 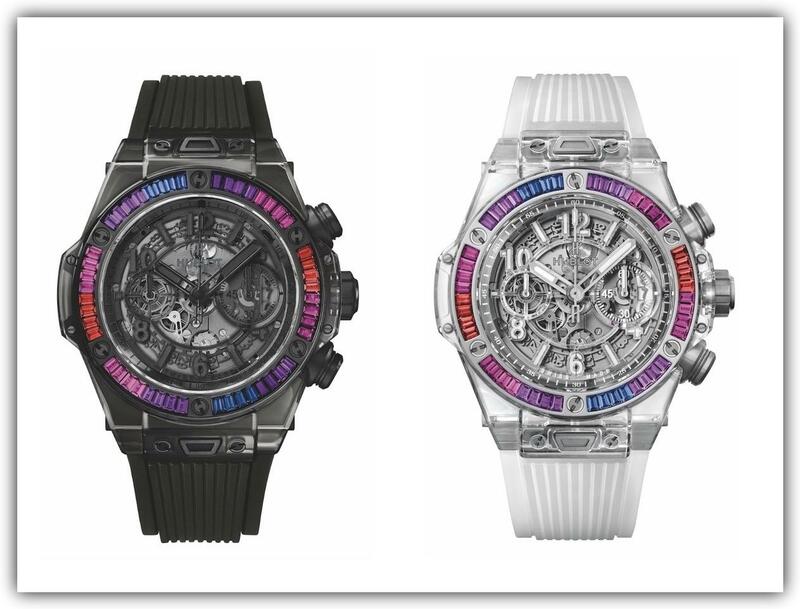 Taking its slogan of “The Art of Fusion” very seriously, Hublot has poured time and resources into creating new materials, unheard of in the watch industry, such as the large, uniformly colored blocks of sapphire from which the brand carves the cases in the Sapphire line. 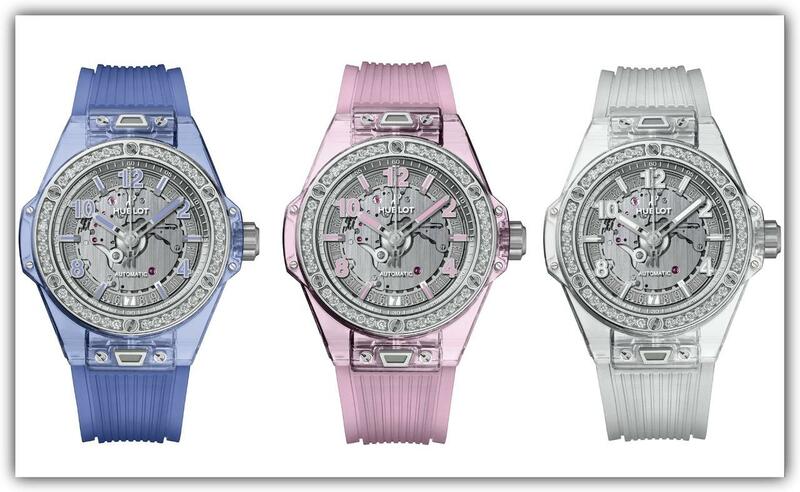 For the Big Bang One Click Sapphire 39 mm, Hublot masterfully added traces of aluminum oxide and titanium oxide to create the pastel tones of blue and pink. Limited to 200 pieces each, each model boasts 42 diamonds on the bezel for a total weight of 1 carat. With the clear or all-black smoky sapphire crystal representing the vast nothingness that makes up most of outer space, Hublot captures a bit of the magic of the rainbow-hued stars with perfectly matched amethysts and colored sapphires. Like the young blue stars and older red stars that punctuate space and astound with their spectacular beauty, the colored stones on the bezel of the 45mm sapphire case run up and down the visible light spectrum. 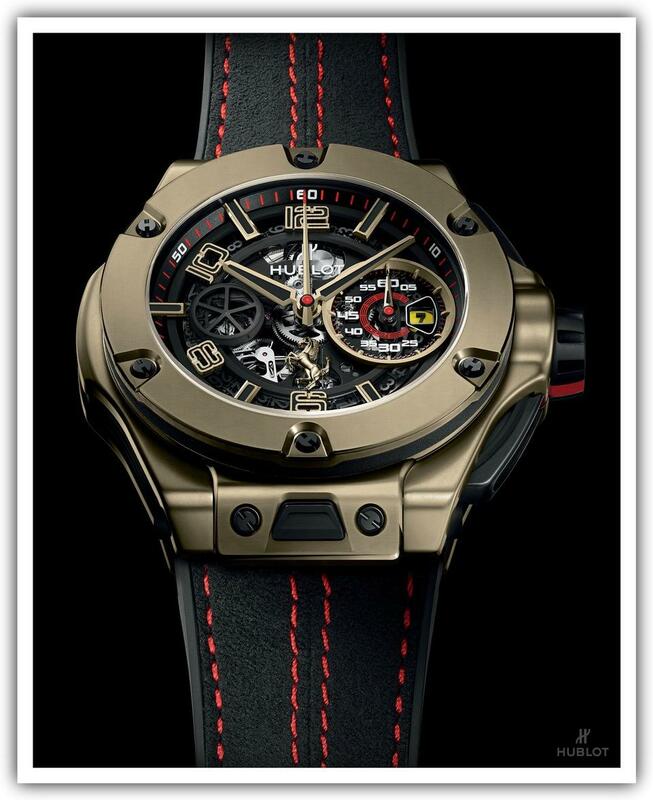 Hublot and Ferrari their first collaboration in 2012, with the first Big Bang Ferrari in Magic Gold, Hublot’s extraordinary alloy. 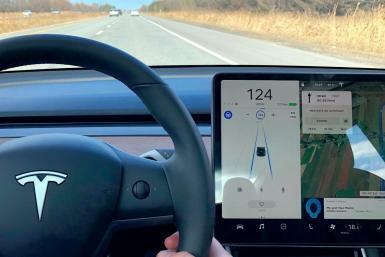 The latest model, limited to 250 pieces, updates the partnership with a new dial architecture: a tachometer-style minute counter and a date aperture in gear selector mode, a prancing horse at 6 o’clock, and a seconds counter designed like an air extractor at 9 o’clock. Within, Hublot’s UNICO HUB1241 movement beats at 28,800 vph and provides a power reserve of 72 hours. 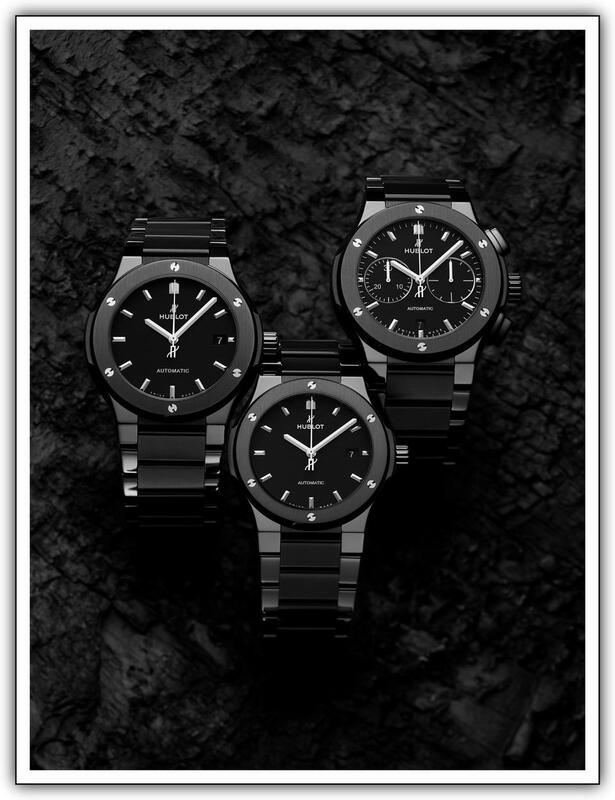 The Classic Fusion collection adds a sleek new look with a black ceramic bracelet. A pioneer in the use of ceramic in watchmaking, Hublot takes it a step further, creating a new essential for the stylish man’s wrist. Crafted in ceramic zirconium oxide, and paired with a 45mm or 42mm ceramic case, the strap complements the opaque black or blue sunray dial of the chronograph or three-handed dial display. Continuing Hublot’s fruitful partnership with style guru Lapo Elkann, the brand adds sporty new chronograph models to the collection, dressed in fabrics inspired by the 60s and 70s, but possessed of classic appeal. In blue houndstooth, pinstripe or Prince of Wales check, these models make their wearer the sharpest dressed man in any room. Inspired by Pop Art, Richard Orlinski’s works present a bold, bright, slightly skewed version of the world, recreating familiar animals in faceted silhouettes. 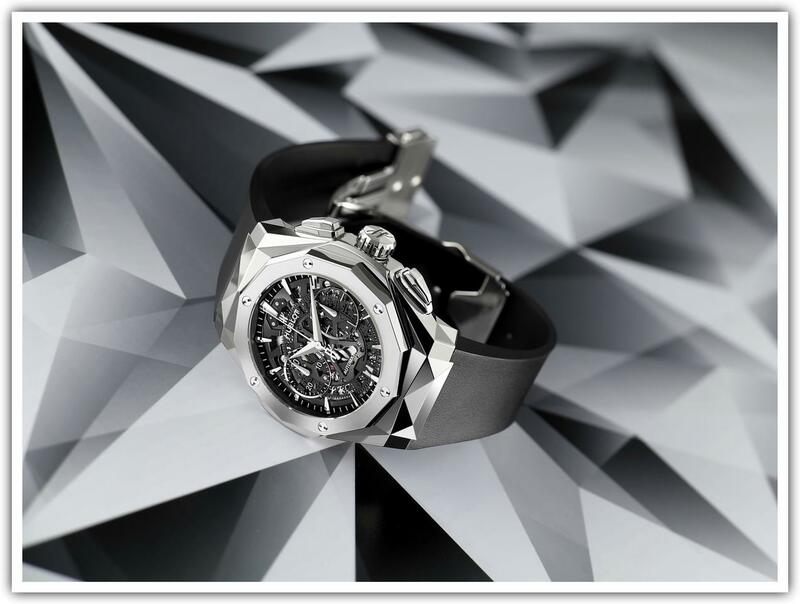 He unleashed his magic on Hublot’s Classic Fusion lines, brining his signature facets to bear on a design that had to be modeled before it was cut from ceramic and titanium. Each material is mirror-polished, just like an Orlinski piece, and each material comes in a limited edition of 200 pieces, transforming the watch into a wrist-worn piece of art. 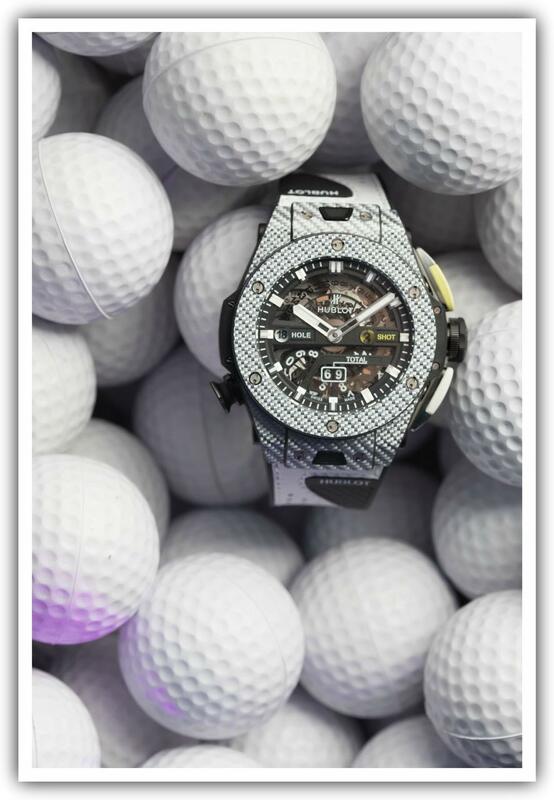 Hublot also took the opportunity to present a collaboration with the world’s #1 golfer, Dustin Johnson, at SIHH. 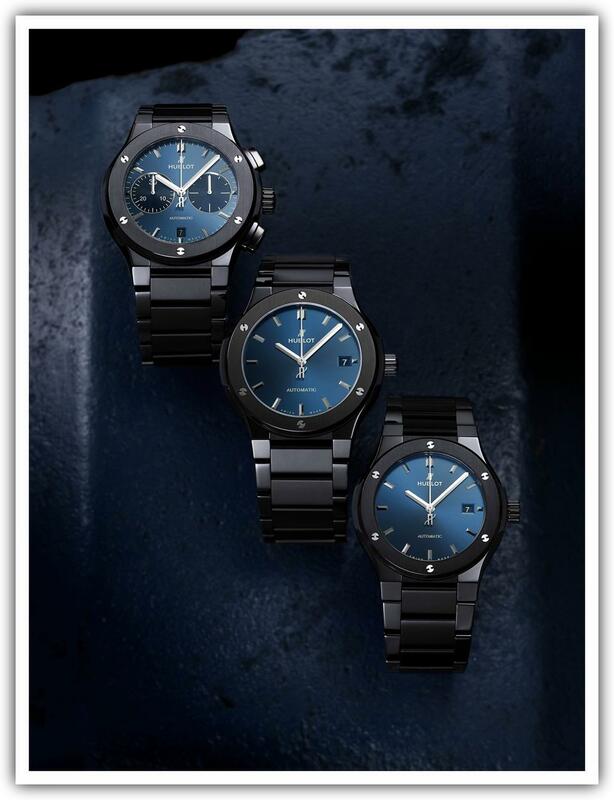 The watch brand designed a new UNICO movement, specifically for golf players. One key attribute, its light weight of 98g, comes from Texalium®, a composite of fiberglass and aluminum. Designed as a chronograph, the MHUB1580 mechanism within displays the number of strokes taken, counts the strokes per hole, resets the stroke counter and shows the number of total strokes taken. 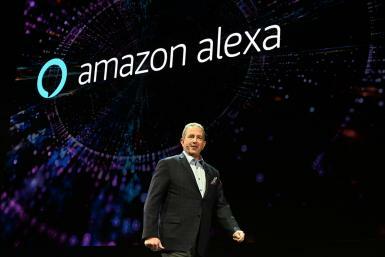 The tee-shaped pusher sets the counters to zero at the end of the round. Two interchangeable straps, one in white leather like a golf glove, and the other in a technical fabric with a Velcro fastener to ensure perfect fit, allude to the game’s two aspects of style and technique.